Acute hyperglycaemia rapidly suppresses endogenous glucose production (EGP) in non-diabetic individuals, mainly by inhibiting glycogenolysis. Loss of this ‘glucose effectiveness’ contributes to fasting hyperglycaemia in type 2 diabetes. 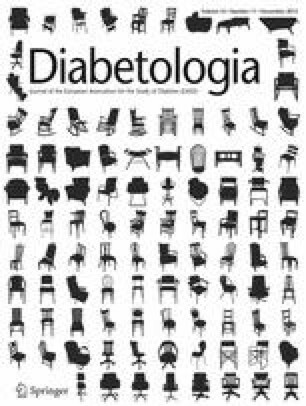 Elevated NEFA levels characteristic of type 2 diabetes impair glucose effectiveness, although the mechanism is not fully understood. Therefore we examined the impact of increasing NEFA levels on the ability of hyperglycaemia to regulate pathways of EGP. We performed 4 h ‘pancreatic clamp’ studies (somatostatin; basal glucagon/growth hormone/insulin) in seven non-diabetic individuals. Glucose fluxes (d-[6,6-2H2]glucose) and hepatic glycogen concentrations (13C magnetic resonance spectroscopy) were quantified under three conditions: euglycaemia, hyperglycaemia and hyperglycaemia with elevated NEFA (HY-NEFA). EGP was suppressed by hyperglycaemia, but not by HY-NEFA. Hepatic glycogen concentration decreased ∼14% with prolonged fasting during euglycaemia and increased by ∼12% with hyperglycaemia. In contrast, raising NEFA levels in HY-NEFA caused a substantial ∼23% reduction in hepatic glycogen concentration. Moreover, rates of gluconeogenesis were decreased with hyperglycaemia, but increased with HY-NEFA. Increased NEFA appear to profoundly blunt the ability of hyperglycaemia to inhibit net glycogenolysis under basal hormonal conditions. M. Hawkins and P. Kishore contributed equally to this study. Increased endogenous glucose production (EGP) appears to be the main source of fasting hyperglycaemia in type 2 diabetes mellitus [1, 2] and seems to be proportional to the degree of metabolic dysregulation [3, 4]. In non-diabetic individuals, rising glucose levels per se result in rapid and potent suppression of EGP, a phenomenon termed ‘glucose effectiveness’. This regulation is completely lost in individuals with moderate-to-poorly controlled type 2 diabetes [4, 5], while those with optimally controlled type 2 diabetes retain normal glucose effectiveness [4, 6]. Elevated NEFA levels characteristic of type 2 diabetes have been shown to impair glucose effectiveness, but the mechanism is still not fully understood. The two major sources of EGP are breakdown of glycogen stores (glycogenolysis) and de novo synthesis of glucose via gluconeogenesis (GNG). Previous studies have shown that increased plasma NEFAs potently stimulate hepatic GNG [7, 8]. We previously demonstrated rapid blunting of hepatic glucose effectiveness and stimulation of GNG by raising plasma NEFAs in non-diabetic individuals , while lowering plasma NEFAs in individuals with type 2 diabetes completely restored glucose effectiveness . It is not known, however, whether elevated NEFAs also impair the ability of hyperglycaemia to regulate net glycogenolysis, thereby contributing to the loss of glucose effectiveness. New therapeutic targets in the treatment of type 2 diabetes are clearly needed, and there is currently no means of consistently lowering plasma NEFAs. Therefore it is important to understand the mechanisms whereby elevated NEFAs impair glucose effectiveness and to what extent they contribute to the loss of this regulation. Thus this study examined the effect of elevated NEFA levels on the ability of hyperglycaemia per se to regulate net glycogenolysis. Seven healthy male volunteers were recruited from the Clinical Research Center database and by local advertising. Informed, written consent was obtained in accordance with the policies of the Einstein Institutional Review Board. The volunteers were taking no medications, had no family history of type 2 diabetes, and were not involved in any other research study. The mean ± SEM age and BMI were 32.1 ± 3.1 years and 25.6 ± 1.0 kg/m2, respectively. A 2 h OGTT was performed to ensure normal glucose tolerance. These studies examined the effect of an acute elevation in plasma glucose levels (from 5 to 10 mmol/l) and the effect of elevated plasma NEFAs on specific pathways of glucose production. Rates of EGP (d-[6,6-2H2]glucose), GNG (deuterated water) and net glycogenolysis (13C magnetic resonance spectroscopy imaging [MRSI]) were compared under matched hormonal conditions in each participant on three separate occasions: at euglycaemia vs hyperglycaemia vs hyperglycaemia with elevated NEFAs. HY-NEFA (n = 7): 4 h hyperglycaemic (∼10 mmol/l) pancreatic clamp studies with infusion of Liposyn 20% (Abbott Laboratories, North Chicago, IL, USA) throughout the studies (0.42 ml/min) to reproduce the moderately elevated NEFA levels observed in poorly controlled type 2 diabetes [11, 12]. Of note, since Liposyn raises plasma glycerol levels, we previously examined the effect of glycerol alone on EGP in healthy individuals at levels similar to those seen with Liposyn infusion . There was no difference in EGP during euglycaemia and no effect on glucose effectiveness with hyperglycaemia during glycerol infusion compared with matched controls. All studies were completed after an overnight fast and were at least 1 month apart. All experiments consisted of 240 min insulin/somatostatin (250 μg/h) infusions with replacement of glucoregulatory hormones (glucagon 1 ng kg−1 min−1; growth hormone 3 ng kg−1 min−1). Throughout the euglycaemic clamp study, the plasma glucose concentration was maintained at basal levels (∼5 mmol/l). This was attained by infusion of insulin at adequate rates to maintain euglycaemia without requiring glucose infusion. Once optimal insulin infusion rates were attained in each individual by variable insulin infusion during the first ∼90 min, these rates were maintained for the duration of the study. During the second (hyperglycaemic) study, plasma glucose concentrations were acutely increased to 10 mmol/l and then clamped at this hyperglycaemic level by means of variable glucose infusion. Insulin was infused at the basal rate that was individually obtained for each individual during the euglycaemic experiment. Glucose fluxes were measured with d-[6,6-2H2]glucose (prime infusion of 5.32 mg kg−1 min−1 for 5 min, continued at 0.038 mg kg−1 min−1 for the duration of the study). The enrichment of infused dextrose was kept equivalent to plasma glucose enrichment by addition of d-[6,6-2H2]glucose to the infusate . From t = 0 to t = 240 min, blood samples were obtained for determination of plasma glucose, insulin, glucagon, C-peptide, growth hormone, NEFA, glycerol and lactate concentrations, as well as d-[6,6-2H2]glucose enrichment. Natural abundance 13C MRSI was performed during all studies to determine hepatic glycogen concentrations, as described below. Blood was sampled for deuterated glucose during the final 15 min of each study. For fatty acid and glycerol determinations, blood samples were collected in chilled tubes containing EDTA as an anticoagulant and the lipase inhibitors, tetrahydrolipstatin and paraoxon, to prevent ongoing in vitro lipolysis . The tubes were immediately placed on ice. Plasma was obtained by refrigerated centrifugation within 20 min of blood drawing and stored at −70°C until subsequent analyses were performed. All infusions were stopped at t = 240 min. Participants were given a standard meal, and blood glucose levels were monitored for ∼1 h after the study. Participants drank deuterated water (total of 5 g D2O/kg total body water, divided into three doses) at 20:00, 23:00 and 03:00 hours. Water subsequently ingested ad libitum was enriched to 0.5% with D2O to maintain isotopic steady state. Blood was drawn to determine the C-5/C-2 ratio during the clamp study at t = 225 and 240 min. In vivo 13C MRSI was performed on a 4 T Varian/Magnex human MRSI system using a 13C 11 cm circular surface coil with a 13.5 cm coplanar butterfly 1H coil. The radiofrequency (RF) coil was placed over the lateral aspect in the supine participant. Initial coil placement was determined by percussing the borders of the liver, and the final position was confirmed by imaging. T1-weighted gradient echo images (repetition time/echo time = 250/8 ms) were acquired through the 1H coil for localisation. One-dimensional spectroscopic imaging was used to acquire 13C MRSI data with the following variables: 0.3 s repetition time; 330 μs non-selective excitation pulse; 270° tip angle; 15,000 Hz sweep width; and 2,048 complex points. RF power was calibrated using a microsphere filled with 99% enriched [13C]formic acid (Cambridge Isotope Laboratories, Andover, MA, USA) at the centre of the coil. The field of view of 60.0 cm with 32 phase-encoding steps resulted in one-dimensional nominal voxel resolution of 1.875 cm. A Gaussian-weighted phase-encoding scheme was used to improve the signal-to-noise ratios without sacrificing the efficiency of localisation . One data point for hepatic glycogen was acquired every 15 min. Data processing was performed using routines written in MATLAB (MathWorks, Natick, MA, USA). C-1 glycogen doublets resonated at 100.1 ppm were analysed using spectral domain fitting. Quantification of hepatic glycogen concentrations was conducted using an external concentration standard, i.e. a matching glycogen phantom composed of 300 mmol/l glucosyl units of oyster glycogen (Sigma, St Louis, MO, USA) and 60 mmol/l KCl. A [13C]formic acid sphere placed at the centre of the 13C coil served to calibrate the pulse angle and coil loading. The integrated area of the C-1 glycogen resonance (100.1 ppm) was then referenced to an equivalently acquired phantom sample, corrected for receiver gain and reception sensitivity. Finally, individual variations in liver volume and shape were also corrected by image corrections. The liver outline of each participant determined from in vivo MRI was superimposed on the pulse sequence image, and the relative ratio of these integrals was used as the correction factor to obtain the final concentration of hepatic glycogen. Glycogen measurements were acquired every 15 min before the start of the clamp and 180–240 min during the clamp. 13C MRSI measures net changes in liver glycogen concentration. Thus the percentage changes in glycogen concentration from the start to the end of the clamp study were assessed by this method. Glycogen flux rates were calculated by subtracting rates of GNG (mg kg−1 min−1), as determined by C-5/C-2 ratios, from total EGP (mg kg−1 min−1). Plasma glucose, insulin, C-peptide, glucagon, NEFA, glycerol and lactate concentrations were measured as previously described [7, 16]. For the d-[6,6-2H2]glucose determinations, GC/electron-impact MS analysis was performed in the CTSA Analytic Core Laboratory . Plasma samples for GC-MS were derivatised after protein precipitation to the aldehyde penta-acetate with hydroxylamine hydrochloride acetic anhydride. Measurements of GNG were performed at the Mayo Clinic, using Landau’s established method which measures deuterium enrichment at C-2 and C-5 on plasma glucose . Rates of EGP and glucose uptake (Rd) were calculated as previously described [10, 19]. Data for glucose turnover, plasma hormones and substrate concentrations represent the mean values during the final 60 min of each clamp study. Data were analysed using SPSS Version 19.0. Repeated-measures ANOVA was used to compare responses among different study conditions. Mean data at baseline (t = 0 min) and during the last hour of the clamp studies (t = 180–240 min) were compared. Significant differences identified by ANOVA were further analysed by post hoc tests, such as Tukey and Scheffé. All data are presented as mean ± SEM unless otherwise specified. A p value of <0.05 was considered significant. The mean age and BMI were 32.1 ± 3.1 years and 25.6 ± 1.0 kg/m2, respectively. After an overnight fast (t = 0), plasma insulin, C-peptide, NEFA, glycerol and glucose concentrations were comparable on all three study days (Table 1). Fasting lactate levels were higher in the HY-NEFA than the EU condition. The fasting hepatic glycogen concentration was 340.4 ± 19.0 mmol/l and did not differ between all three study visits (p = 0.54). Steady-state conditions were achieved, as glucose specific activity was constant after tracer equilibration during both euglycaemia and hyperglycaemia in each individual participant and study. Plasma glucagon and growth hormone levels remained comparable during all study visits. C-peptide levels were suppressed by somatostatin in the EU and HY conditions, compared with fasting levels (p < 0.005 in both groups), and trended downward in the HY-NEFA condition (p = 0.07). Although C-peptide levels were slightly higher with the onset of hyperglycaemia during HY and HY-NEFA, compared with EU, they were comparable and would therefore not be expected to contribute to differences between these groups (Table 1). The portal insulin levels attained with this protocol are likely to reproduce physiological fasting conditions, given an anticipated portal/systemic insulin ratio of ∼2.4:1, as previously described [20, 21]. With fasting systemic insulin levels of ∼80 pmol/l in our participants, corresponding fasting portal levels would approximate 192 pmol/l, which is consistent with the systemic levels observed during the final hour of these clamp studies. Lactate levels remained stable during the steady-state period in all groups. Mean plasma glucose levels during the euglycaemic clamp studies were 5.3 ± 0.2 mmol/l. Mean insulin infusion rates required to maintain euglycaemia were 0.16 ± 0.02 μU kg−1 min−1 for all study days. Mean plasma glucose levels during the final hour of the HY and HY-NEFA studies were not different (10.3 ± 0.2 and 10.4 ± 0.1 mmol/l, respectively). Plasma NEFA levels were 113.6 ± 24.1 and 90.2 ± 17.8 μmol/l during the EU and HY studies, respectively, and were not different (p = 0.5) (Table 1). The infusion of Liposyn raised plasma NEFAs to levels comparable to those previously seen in type 2 diabetes . Significant elevations in NEFA levels were attained after ∼1 h of Liposyn infusion in the HY-NEFA studies, compared with the EU and HY studies, and averaged 499.8 ± 91.0 μmol/l during the last hour of the study. Glycerol levels were elevated during Liposyn infusion in the HY-NEFA studies (77.3 ± 8.4 vs 16.4 ± 2.8 [EU] and 12.6 ± 1.8 [HY] μmol/l, p < 0.01) (Table 1). The mean rate of glucose infusion required to maintain target hyperglycaemia during the last 60 min of the HY studies was 3.8 ± 0.3 mg kg−1 min−1. The glucose infusion rate required to maintain hyperglycaemia was significantly lower with HY-NEFA than with HY (HY-NEFA = 1.8 ± 0.2 mg kg−1 min−1, p = 0.02 vs HY), suggesting a decrease in glucose effectiveness with increased NEFA levels. Hyperglycaemia suppressed EGP by 65.0 ± 9.7% compared with EU (p < 0.005; Fig. 1a). Elevated NEFA levels resulted in a significant blunting of the suppression of EGP with hyperglycaemia (29.1 ± 18.8% EGP suppression vs EU; p = 0.003; Fig. 1a). Hyperglycaemia suppressed GNG by ∼77% (p = 0.004 vs EU; Fig. 1b). Co-infusion of NEFAs during hyperglycaemia (HY-NEFA) impaired the ability of hyperglycaemia to suppress GNG. Indeed, rates of GNG remained elevated with HY-NEFA compared with HY (p = 0.0003), and did not differ from EU (p = 0.4; Fig. 1b). Under basal hormonal conditions, net hepatic glycogen concentration decreased by ∼14% over the course of the euglycaemic studies and increased by ∼12% with hyperglycaemia alone, despite prolonged fasting (p = 0.002; Fig. 2a, b). However, raising NEFA levels during hyperglycaemia caused a substantial ∼23% reduction in net hepatic glycogen concentration (p = 0.00001; Fig. 2a, b). Similarly, the contribution of net glycogenolysis to EGP (glycogen flux) was significantly increased in the HY-NEFA condition compared with the HY condition (p = 0.002), but did not differ from EU (p = 0.6; Fig. 2c). Figure 3 shows the time course of hepatic glycogen concentrations for all participants, and Fig. 4 shows the MRSI spectra of glycogen for one representative participant during all three study types. Hence, the ability of hyperglycaemia to inhibit net glycogenolysis was completely blunted in the presence of elevated NEFAs. This finding is particularly striking in light of the elevated rates of GNG in the HY-NEFA condition relative to the HY condition, which would have otherwise tended to suppress net glycogenolysis . This is the first evidence that increased NEFAs profoundly blunt the ability of hyperglycaemia to inhibit net glycogenolysis under basal hormonal conditions. Moreover, these studies are the first to show that hyperglycaemia has suppressive effects on GNG in humans. Since being able to sense and appropriately respond to hyperglycaemia are imperative to achieving glucose homeostasis, understanding the mechanisms whereby this regulation is lost in type 2 diabetes is of great clinical importance. We and others have previously demonstrated important effects of increased NEFAs on glucose effectiveness and the upregulation of GNG in humans [7, 8, 9, 11]. Given the striking effect of hyperglycaemia in inhibiting net glycogenolysis , it is of considerable importance to determine the impact of elevated NEFAs on this regulation in type 2 diabetes. Several groups have investigated the mechanism(s) whereby glucose per se inhibits EGP. Rossetti et al demonstrated that acute hyperglycaemia suppresses EGP by ∼50% in the presence of basal insulin and glucagon levels in rodents, with marked inhibition of glycogenolysis . Moreover, Sindelar and colleagues showed that a doubling of arterial glucose levels decreased net hepatic glucose output and reduced hepatic glycogenolysis by 78% in overnight-fasted conscious dogs in the presence of basal intraportal insulin and glycogen levels . The inhibitory effects of hyperglycaemia on net hepatic glycogenolysis are also operative in overnight-fasted non-diabetic humans, and are attributable to inhibition of glycogen phosphorylase flux . Indeed, glucose 6-phosphate appears to regulate hepatic glycogenolysis through inactivation of the glycogen phosphorylase enzyme . This is in contrast with hyperinsulinaemia, which inhibits net hepatic glycogenolysis by stimulating glycogen synthase flux and increasing ‘glycogen cycling’, i.e. cycling of glucose 6-phosphate into and out of glycogen . However, very little is known about how glucose per se affects net glycogenolysis in the presence of elevated NEFAs. Increased NEFA availability has been shown to contribute significantly to the metabolic dysregulation and loss of glucose effectiveness in type 2 diabetes [4, 10, 27]. We previously reported that raising NEFAs in non-diabetic individuals for ≥3 h reduced the normal suppressive effect of glucose by 50% . NEFAs are known to stimulate hepatic gluconeogenesis both in vivo and in perfused rat livers [8, 9]. Importantly, increased circulating NEFAs also affect the gene expression and activity of glucose 6-phosphatase and glucokinase, the hepatic enzymes responsible for regulating EGP. Specifically, NEFAs promote the hepatic production of, and exert stimulatory allosteric effects on, glucose 6-phosphatase . Conversely, NEFAs decrease both the mRNA levels and activity of glucokinase [29, 30]. Of note, although we were unable to complete glycerol control studies during this protocol for technical reasons, our previous studies did not demonstrate any effect of glycerol infusion alone on EGP or glucose effectiveness in healthy individuals . Given our previous results and those of Roden et al  showing similar elevations in GNG with lipid emulsion to those with glycerol alone, we do not believe that glycerol made any meaningful contribution to the observed effects on glucose flux during hyperglycaemia in the present studies. In healthy individuals, increased plasma NEFAs have been shown to not only stimulate GNG, but cause compensatory inhibition of glycogenolysis during euglycaemia . Indeed, we and others have previously demonstrated that isolated changes in NEFA levels do not change the rates of EGP during euglycaemia [9, 33]. This appears to be due to an intact autoregulatory mechanism, which maintains overall constant rates of EGP in response to fluctuations in blood glucose, primarily via changes in glycogenolysis . However, Shah et al  demonstrated that elevated NEFAs increased splanchnic glucose production in non-diabetic women in the presence of hyperinsulinaemia and hyperglycaemia. Although specific pathways were not examined, this suggests that autoregulation is not intact under these conditions. The present studies likewise showed increased rates of EGP with elevated NEFAs and hyperglycaemia under basal insulin conditions. Of note, the metabolic conditions of the present studies were designed to replicate the chronic metabolic milieu observed in longstanding type 2 diabetes, where portal insulin levels would be expected to be lower. Although relative insulin deficiency occurs early in the course of type 2 diabetes and even impaired glucose tolerance, extensive portal insulin deficiency (basal portal insulin concentrations in the presence of hyperglycaemia, as in the present study) is expected to occur rather late in the progressive course of the disease due to advanced beta cell failure . Importantly, both GNG and net glycogenolysis were increased in the present studies, contributing to the overall increased rates of EGP. In the present studies, hepatic glycogen stores were reduced and hepatic glycogen flux, estimated using deuterated water, was significantly increased in healthy individuals in the presence of both hyperglycaemia and elevated NEFAs compared with hyperglycaemia alone. This is an important finding in light of the known reduction in glycogen stores with type 2 diabetes, suggesting that the metabolic defects of type 2 diabetes may be responsible and that it may be reversible. Indeed, insulin-resistant states, including poorly controlled diabetes, have been associated with impaired insulin-stimulated glycogen synthesis [36, 37, 38, 39, 40]. Defects in glycogen synthesis may be the result of dysregulation of the enzymes glycogen phosphorylase and/or glycogen synthase. Moreover, although no direct evidence is available from our studies, it is possible that NEFA-induced decreases in glucokinase flux, as would be expected in the present studies, result in a decreased glucose 6-phosphate pool, thereby removing an important inhibitory signal from hepatic glycogenolysis. Glucokinase plays a key role in hepatic glycogen metabolism [41, 42], and its activity has been shown to be decreased in association with the metabolic changes seen in type 2 diabetes [43, 44]. Since glucokinase activates hepatic glycogen synthase—the rate-controlling enzyme for glycogen synthesis [42, 45]—the observed increased rates of net glycogenolysis may be the result of decreased glycogen synthase activation by glucokinase. To conclude, these are the first studies to show that elevated NEFAs impair the ability of hyperglycaemia to suppress net hepatic glycogenolysis. Thus the normal regulation of both GNG and glycogenolysis by hyperglycaemia is lost with increased plasma NEFAs, which is of substantial clinical relevance to type 2 diabetes. Increases in net glycogenolysis may be due to a decreased glucose 6-phosphate pool and/or decreases in glucokinase activity, leading to loss of inhibition of glycogen phosphorylase and/or activation of glycogen synthase activity. Whether the reductions in hepatic glycogen concentration seen with hyperglycaemia and elevated NEFAs are due to impaired glycogen synthesis or increased glycogen breakdown remains to be determined. Considering that hyperglycaemia and hyperlipidaemia are both hallmarks of type 2 diabetes, understanding the mechanisms whereby these factors regulate EGP is of central importance and may provide future targets for intervention. We thank L. Clintoc (Albert Einstein College of Medicine) and C. Fratila (Albert Einstein College of Medicine) for assisting with the studies, R. Sgueglia (Albert Einstein College of Medicine) for determinations performed in the Diabetes Research and Training Center Hormone Assay Core (DRTC: P60-DK20541), H. Cohen (Albert Einstein College of Medicine) for biostatistical assistance, and the staff of Einstein’s Clinical Research Center (CRC: M01-RR12248) for outstanding patient care. We also acknowledge H. Shamoon (Albert Einstein College of Medicine) for many helpful discussions, the late B. Landau (Case Western Reserve University) and C. Viswanathan (Case Western Reserve University) for helping to design the gluconeogenesis measurements, and B. A. Dicke (Mayo Clinic) for performing the gluconeogenesis assays. This work was presented in preliminary form at the 69th Scientific Sessions of the American Diabetes Association, June 2009, in New Orleans, Louisiana. This work was supported by funding from the American Diabetes Association and by NIH 5R01 DK069861 and NIA 1P01 AG021654 (to M. Hawkins) and NIH 1K23RR02335-01 (to P. Kishore). The project described was supported in part by the National Center for Research Resources (NCRR) and the National Center for Advancing Translational Sciences (NCATS), components of the National Institutes of Health (NIH), through CTSA grant numbers UL1RR025750, TL1RR025748 and KL2RR025749; and UL1TR000086, TL1TR000087, and KL2TR000088. Its contents are solely the responsibility of the authors and do not necessarily represent the official views of the NIH. SKe, MM, RR, SKo and PK performed the studies. SKe, PK and MH wrote the manuscript. MC and JH performed the NMR spectroscopy. RB performed the GNG measurements. All authors analysed and interpreted the data. MH and PK designed the experiments and participated in all aspects of data analysis and manuscript preparation. PK directed the studies, is the guarantor of this work, had full access to all the data, and takes full responsibility for the integrity of data and the accuracy of data analysis. All authors were involved in revising the manuscript critically for important content and approved the final version for publication.